We’d love your help. Let us know what’s wrong with this preview of Stevenson's Treasure by Mark Wiederanders. 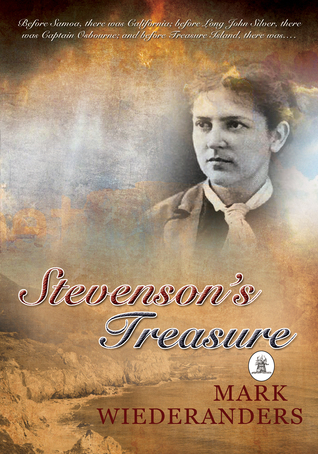 To ask other readers questions about Stevenson's Treasure, please sign up. This book surprised me on several levels. For one, there was a romance as a central theme, and because the protagonist is male (as is the writer), it had a very different feeling and texture than other books I've read with romance as a central theme. I liked it! Robert Louis Stevenson (of Treasure Island fame) fell in love with an older married women who'd just lost a child to serious illness. The woman (Fanny Osbourne) returns his affections, but is loathe to relinquish her secure but unhappy ma This book surprised me on several levels. For one, there was a romance as a central theme, and because the protagonist is male (as is the writer), it had a very different feeling and texture than other books I've read with romance as a central theme. I liked it! Robert Louis Stevenson (of Treasure Island fame) fell in love with an older married women who'd just lost a child to serious illness. The woman (Fanny Osbourne) returns his affections, but is loathe to relinquish her secure but unhappy marriage to be an unstable and unsuccessful writer's wife. Her surviving children don't have any trouble throwing more trouble their way, and his wealthy but ultra-conservative father is no help either. The story takes us from France to the wilds of California and off to the stormy wilderness of Scotland, mostly in pursuit of love, and somewhat in pursuit of a good story. Another thing I really enjoyed was how much we learned about RL Stevenson's struggles--with his health, with his work, and with his personal life. I especially like a little sojourn the dejected writer makes with a personable donkey and a similar one that he makes in California in a state of fevered delirium. The locations where the various scenes take place are characters themselves. The descriptions are vivid, with quirky little details that make the settings pop into my head as if they were my own memories. I was impressed by the fact that the author of this novel clearly did a great amount of research to trace the facts of this story. In the "note to readers" section in the beginning of the book and the "acknowledgements section" in the back, the author details his sources and points out where there were gaps in the history and he was forced to take some liberties. I liked reading through the acknowledgements after finishing the book and learning “WOW that really happened!” As someone who lives in Northern California, I also enjoyed reading the descriptions of the Monterey Bay area, San Francisco and the Napa Valley/Calistoga area during the late 1800s. It sounded like wild times! This book was an engaging read that kept my interest from beginning to end. As an occasional reader of historical fiction, I have enjoyed such books as "The Other Boleyn Girl" and "Girl with a Pearl Earring." I would venture to say this story is as compelling as those but is written in a smoother, more eloquent style. If you're looking for a good book club pick or just some quality leisure reading, check this out! I think this story has something for everyone: action, adventure, suspense, and romance (and a little ooh-la-la, if you know what I mean). Happy reading! Treasure Island by Robert Louis Stevenson was one of the first novels I remember reading, so it was with high expectations that I started reading Stevenson's Treasure, by Mark Wiederanders, and I was not disappointed. In the best tradition of historical fiction, Mark uses an informed imagination to fill in the gaps in his extensive research. This included reading dozens of letters between the main characters, many of which had been 'edited' by family members for the sake of decency. As a strugglin Treasure Island by Robert Louis Stevenson was one of the first novels I remember reading, so it was with high expectations that I started reading Stevenson's Treasure, by Mark Wiederanders, and I was not disappointed. As a struggling young writer in the summer of 1879, Robert Louis Stevenson (referred to as Louis) risks everything and sails across the Atlantic to find Fanny Osbourne, an American woman he has fallen deeply in love with. Awkwardly for our hero, she is much older than him and married with children to a gun-toting Civil War veteran. This is a love that won't be denied, however, so we live through the pleasure and the pain as he tries to find a way for them to be together. I particularly enjoyed the last chapter, 'Finding Treasure', where we find ourselves on a rainy day in Braemar, Scotland and understand a little of how Treasure Island came to be written. The characters in this delightful and unusual book are so real, so individual and three-dimensional, that they seem to walk right off the page. Louis and Fanny, the brilliant but eccentric couple, are extraordinarily well realized, but so are the others: Fanny's children, Louis's parents, their bohemian friends, and even the minor characters. Wiederanders's descriptions of places are also vivid and evocative, especially in the scenes set in California. The reader is in good hands with this author The characters in this delightful and unusual book are so real, so individual and three-dimensional, that they seem to walk right off the page. Louis and Fanny, the brilliant but eccentric couple, are extraordinarily well realized, but so are the others: Fanny's children, Louis's parents, their bohemian friends, and even the minor characters. Wiederanders's descriptions of places are also vivid and evocative, especially in the scenes set in California. Find out how a visit to his son's house inspired the novel, how his mother and the heroine share some traits...and the documents he held in his hands from long ago. What is Stevenson's treasure? This tale will enthrall you with its romance and mystery. An obvious disparity between the beginning and what follows in Robert Louis Stevenson's life challenges the reader and draws you into the story. While our author leaves it us to fit everything together, we are led down the garden path wondering what happened to young Louis (as he is called) between first meeting his lover and his life in later ailing South Sea exile. While we know much about R.L.S. and his ca What is Stevenson's treasure? This tale will enthrall you with its romance and mystery. An obvious disparity between the beginning and what follows in Robert Louis Stevenson's life challenges the reader and draws you into the story. While our author leaves it us to fit everything together, we are led down the garden path wondering what happened to young Louis (as he is called) between first meeting his lover and his life in later ailing South Sea exile. While we know much about R.L.S. and his career as a classical writer, we know little about his young adulthood and his time in the Wild West. His adventures obviously colored his tales; how they influenced him is shown here. This story is one to return to and read again and again. This was a very entertaining book that will stand up over time like those of Stevenson himself. Primary sources flavor the author's dialogue and move his doubly intriguing love story along. His excellent research moves this tale quickly from one locale to another with intriguing glimpses of places like Santa Cruz and Oakland in the 19th century. I thoroughly enjoyed this historical novel about author Robert Louis Stephenson. I was surprised to learn he'd spent so much time in Northern California. Local author, Mark Weideranders, masterfully blends well researched historical facts with engaging storytelling to bring to life a fascinating cast of characters!